Saturday was the big day! The weather was supposed to be perfect...sunny and 80 degrees...the perfect afternoon for playing outside and sipping lemonade in the sun. Well, that was the plan anyway. We awoke saturday morning to an overcast, rainy day with temperatures in the 50s. So much for our plan. The party had to be moved indoors. I didn't have a rainy day back-up plan (since the yucky weather just snuck up on us last minute) so I was a little worried about it but it all worked out it in the end. No one seemed to mind hanging out inside and the kids made themselves right at home running through the house (yikes!) and turning the house into a giant toy box (eek!). 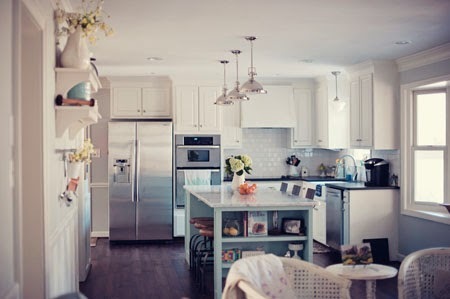 I will admit I was a wee bit stressed over the state of my home but it was nothing a little tidying up afterwards couldn't fix. 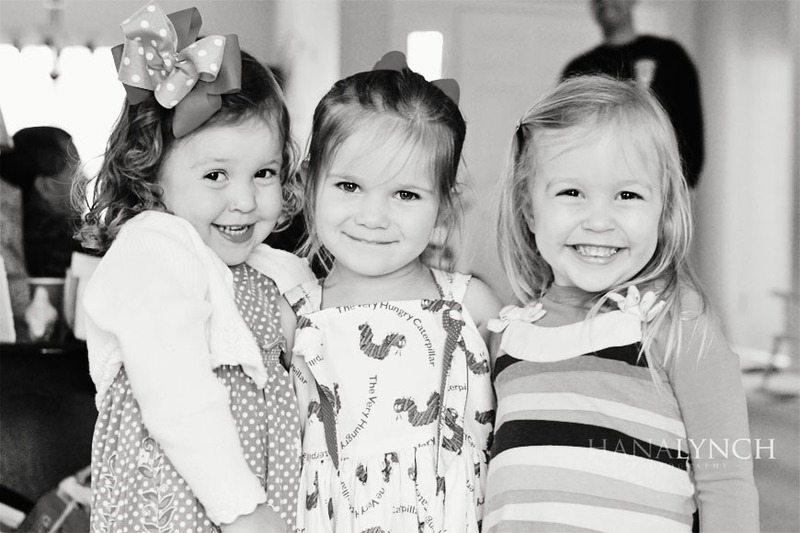 Ella was so excited to have her friends and family over to celebrate her big day. Everyone enjoyed the fruit, snacks, and DELICIOUS cake! The lemonade with the brightly patterned straws was also a huge hit with the kids! The summery color palette of the party table brightened the space up and even though it was chilly and wet outside everyone had a blast inside! Here is a peak into the details of Ella's big day! Enjoy! The cake was stunning...and it tasted even better. It was a super moist vanilla almond cake with raspberry filling and buttercream frosting....aahhh, sooo good! Thanks Rachel, you rocked it again! The beautiful party table reminded me of a summer picnic! I absolutely LOVE how it all came together! 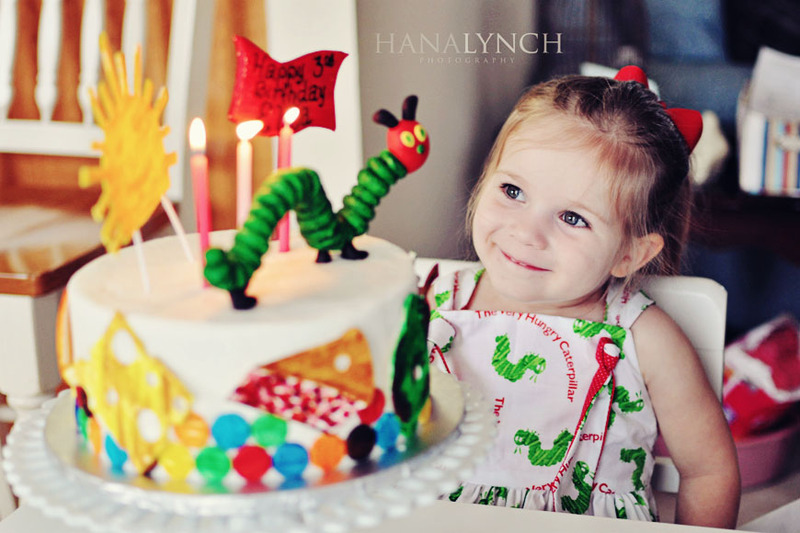 Ella was amazed over her Hungry Caterpillar cake! She couldn't stop smiling! I added lemonade, instead of water, to the white cake mix to give these cupcakes a deliciously sweet flavor!! Yum! Each child got to take home a little container of Caterpillar Food a.k.a M&Ms! A Very Happy Birthday Girl and her Very Hungry Caterpillar! Party was a success! This is the cutest thing I've ever seen!!! You are so creative, Hana. Your kids will have awesome memories not only because you make everything special but because you document it! So amazingly cute! You did such a fabulous job! Adorbs! Absolutely fabulous! I love this idea! Love it! Oh my goodness, how totally gorgeous!! I love every little detail. WOW!!! What a cute, cute party! Such a creative theme. Just gorgeous! 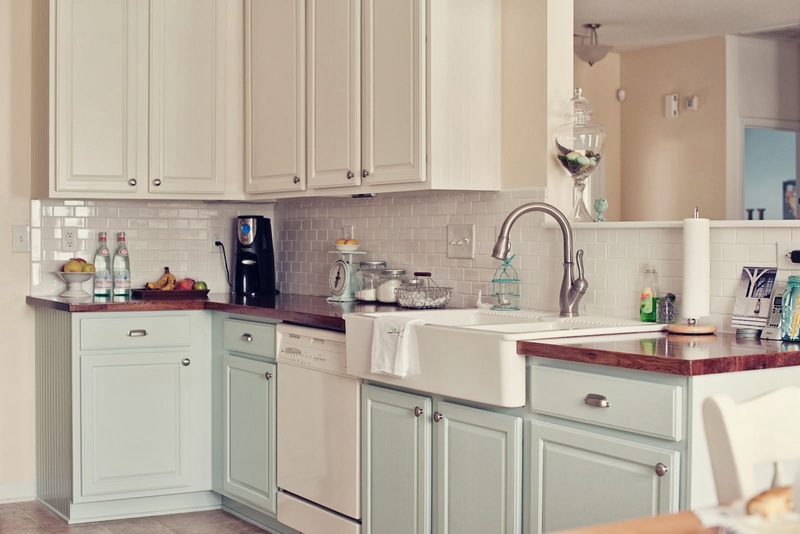 It looks so cheerful and colourful. I bet they all had a wonderful time. What a fabulous party, Hana! She is such a doll! 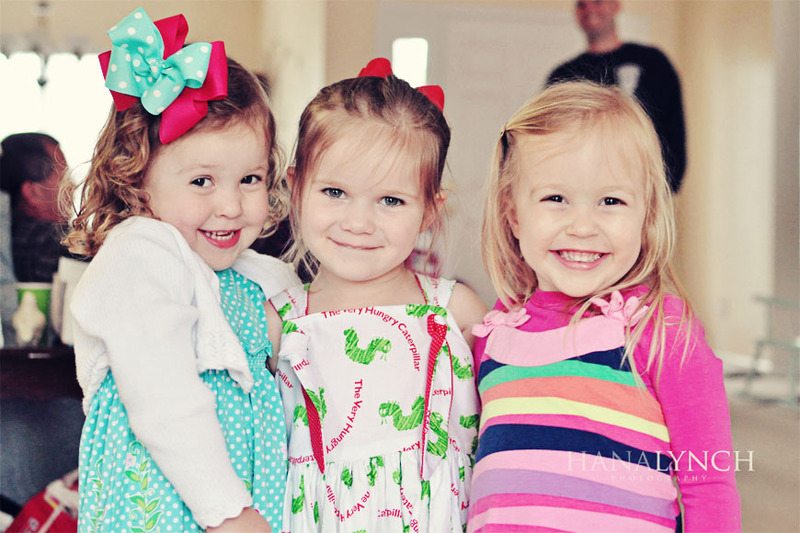 This has to be the most precious birthday party theme ever! Did you make that cake and dress! I'm squealing so much I freaked the dog out! I can't wait to pass this idea, if you don't mind, to my sister for her daughter's next birthday. I can't get over all the details. Well done my dear! I am so absolutely crazy about this! Can I PLEASE feature this party on my blog?!?! 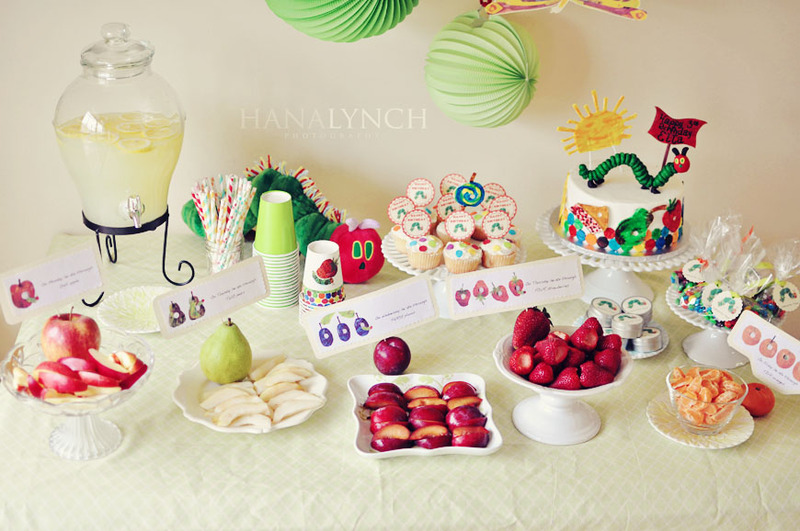 This is the BEST Very Hungry Caterpillar party I've seen yet! Great job creating this magical birthday for your little angel. 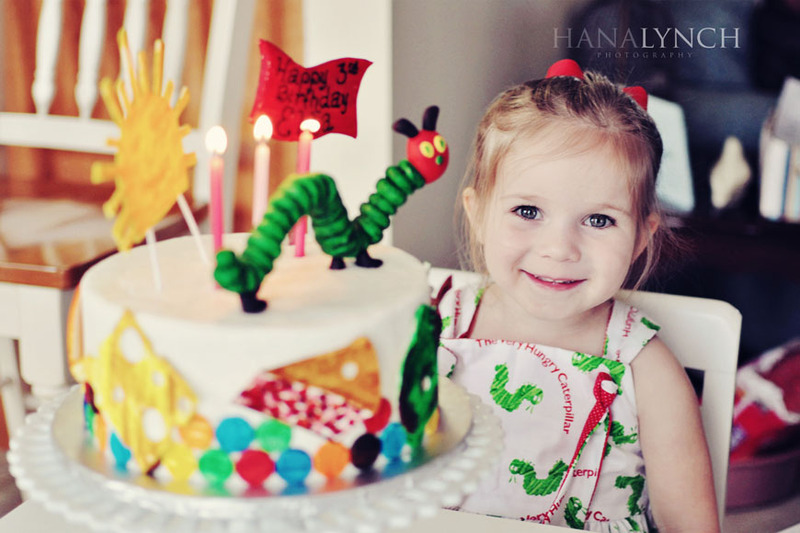 May I ask how you created the caterpillar on top of the cake? This is such a beautiful party! So many great ideas that Ihave to share with our fans on the World of Eric Carle Facebook page. her dress is so adorable! where did you get it? Hi! 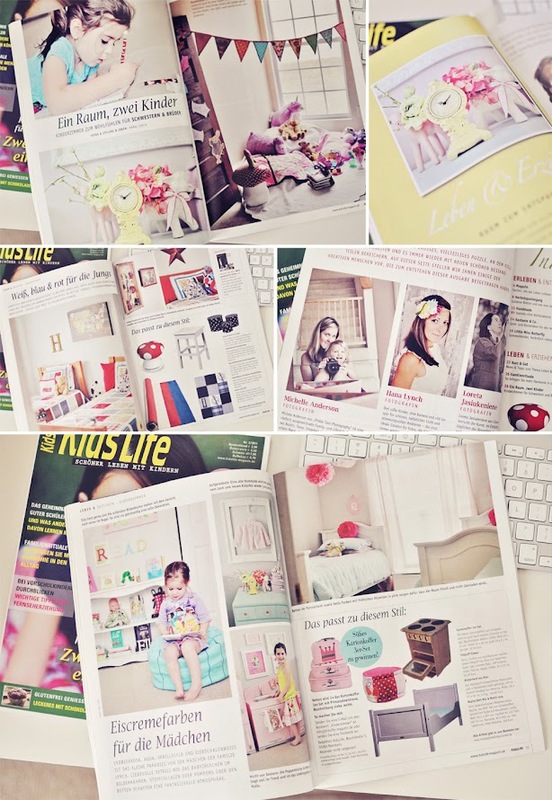 I really love your blog and got inspired by this post for my sons 2nd birthdayparty! Thanks! Your party is inspirational! 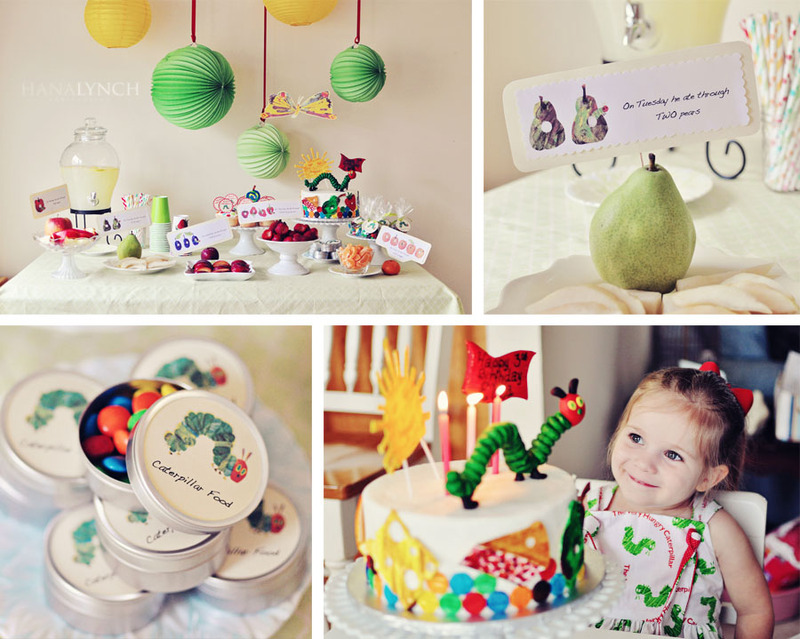 I am throwing a Very Hungry Caterpillar party for my son's first birthday. 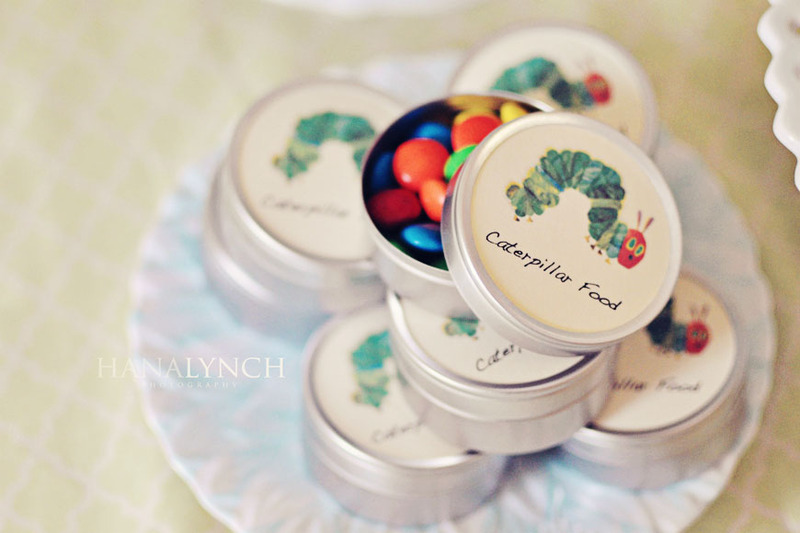 Where did you get the tin and stickers for caterpillar food? I LOVE them. How did you print the graphics? did you get them some place online or copy/scan them? I'm planning on doing this for my daughters 1st birthday and love how you did it! You are so creative! I love everything you did! Im having the same party for my son in October hopefully I will be creative as you! I'm wondering how you did the tags for the food? Do you have a link to printable images? Thanks! Your party was beautiful and your daughter is beautiful too. Do you still have the files with the tags? Could you send me? My baby first birthday is next month, my mom is sick and cant help me Im doing all by myself. This is by far the most beautiful party idea I have seen. 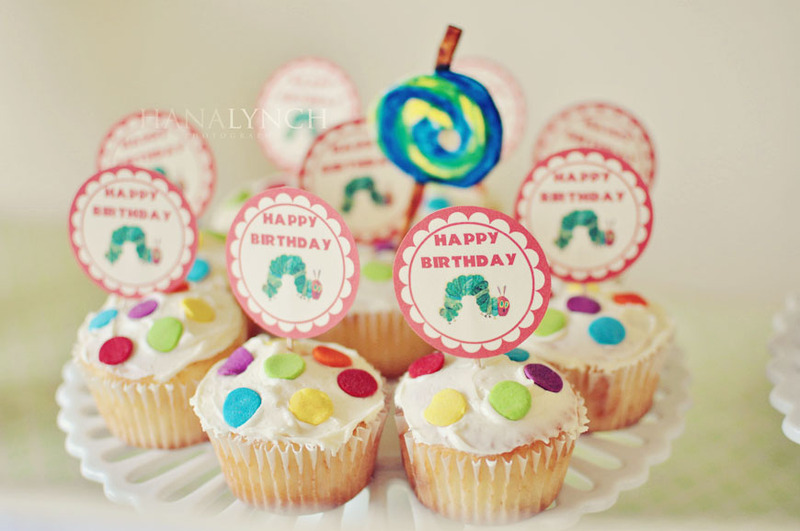 Could you please share the gorgeous printable files for my daughter's 2nd birthday party. Thank you very much!! I too love the party! 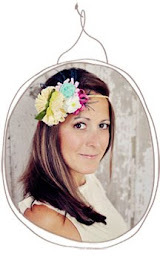 I would love the printables as well as I'm so short or time these days! I like the print outs of the fruit. Do you have those saved where you can email them to dellinger.pepper@gmail.com? I'd appreciate it. Great ideas! I saw this on pinterest. You planned a beautiful party!! I am thinking ahead for my son's 1st bday. Like so many others, I would love your printable file too! If don't mind sharing, my address is swade1129@gmail.com. Thanks so much! What a wonderful party! 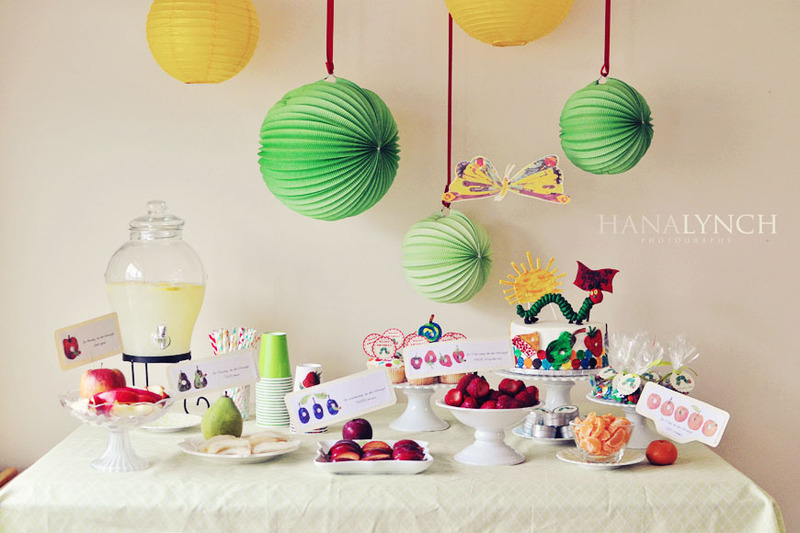 I love all the details, the layout of the food table and decorations. 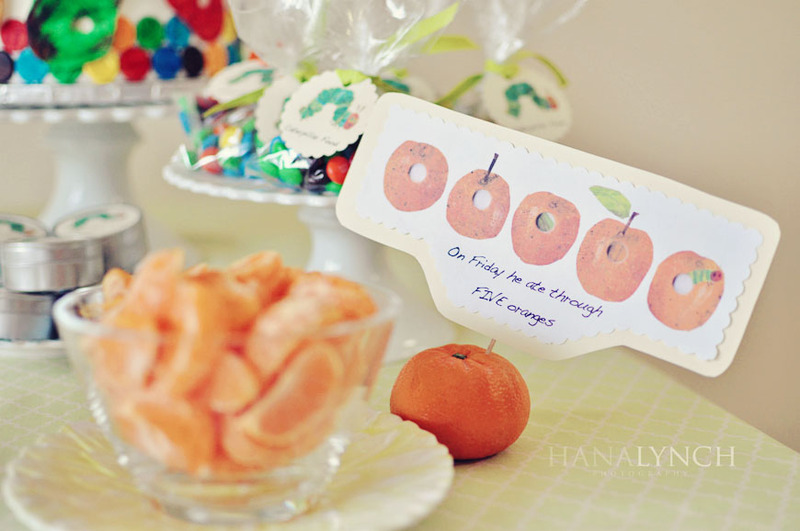 I am planning my best friends baby shower in the same theme and would love to do the same food labels, they are so beautiful! Would it be possible for you to email the files if you still have them and don't mind sharing? Thank you so much for all the amazing ideas! my address is: katieskelton83@gmail.com.